We all know them. They’re the people who swear they are being nice to you and act *shocked* when you are somehow offended by their praises. It’s like they don’t understand how to give a compliment. Worse, it’s like they do understand, but aren’t really trying to give you one. They just want you to think they are. 1. The vast majority of conversation with them revolves around themselves. 2. They have insulted you in recent history, but they did it with a smile and called it a joke. 3. They use the phrase, “Oh, I didn’t mean YOU” often, generally after insulting the entire state of your birth, your job, your friends, your favorite music, people with your hair color…. How many people are you thinking of in your head right now that you just realized are THAT person? How many times are you remembering that they swore they just said something nice to you and they just don’t understand why you’re offended? 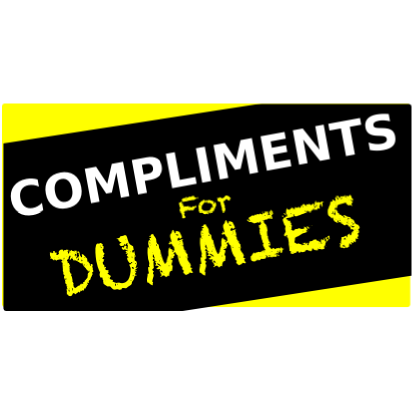 Compliments for Dummies is for them. Maybe, just maybe, you just realized that YOU are that person. You’re thinking of dozens of times in just the past month that you said something to someone that you thought was the kindest praise ever and they responded with a sideways glare and said, “Uh, gee….thanks….I guess.” OOPS. I bet you really thought that person was buying it. It’s okay. I’m here to help. 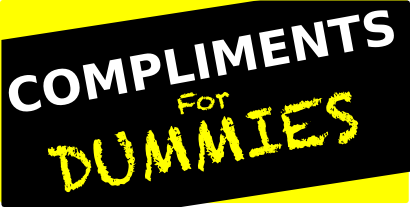 Compliments for Dummies is for YOU! 1. Never start a sentence with the phrase, “Wow, I’m surprised that….” and finish it with something nice. You’re “surprised” that I can cook? Why wouldn’t I be able to cook? Oh, because there is some judgement of me in your head that’s insulting and precludes cooking skills from the “kinda girl I am”. You know what I’m surprised by? The inability of an adult to say something nice without immediately negating it and your expectation that I’m not smart enough to know that you don’t really think very highly of me. 2. When you’ve known someone for quite some time, don’t say “Hey, I never knew that…” followed by a nice thing that you should have noticed already… you know… had you bothered. Yes, I’ve always been smart. I’ve pretty much always been funny too. I’ve always been a lot of things that you might not have noticed, but hey, thanks for admitting that you actually were ignoring me and underestimating me all this time and that you thought I was dumb… and dull. 3. NEVER use the phrase “Well, I told (so and so) that you weren’t…” followed by something nasty, or even tell me that you told so and so that I’m awesome. Trying to “compliment” me by throwing someone else under the bus? STILL insulting, to both of us really. 5. Last, but not least, never, and I do mean NEVER, use the phrase, “Hey, you’re pretty (insert compliment) for a (insert descriptor) person.” NOTHING GOES IN THIS SENTENCE. I am not pretty smart for a blond. I am not pretty independent for a woman. I am not a pretty good dancer for a white girl. NOTHING GOES IN THIS SENTENCE. No exceptions. It’s not a compliment. I promise. If you think it could be, well, you’re pretty ignorant for a human.